Barcelona will be without Ousmane Dembele for up to four weeks after he suffered a hamstring injury in the win over Lyon on Wednesday night. The 21-year-old has shown major improvements this season, contributing 14 goals and eight assists in 35 appearances across all competitions. With that in mind, he will have a key role to play for the Catalan giants between now and the end of the season, with Ernesto Valverde’s side chasing a treble in the La Liga title, Copa del Rey and Champions League. However, he will have to make do without Dembele for the coming weeks now in a real blow for Barcelona, as they will certainly miss the different dynamic and threat he offers to the team. As noted in the club’s official statement, it’s confirmed that the Frenchman will be out of action for between three and four weeks, with a torn femoral biceps muscle in his left hamstring. That is likely to rule him out of games against Real Betis, Espanyol, Villarreal and Atletico Madrid, but it remains to be seen if he is given more time to fully recover in order to avoid suffering any further setbacks with such a delicate injury. 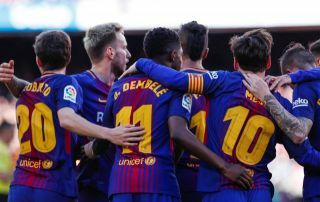 While his absence could ultimately open up opportunities for others to step up and produce, including the likes of Kevin-Prince Boateng and Malcom, there is no doubt that Dembele’s presence will be missed as he provided a reminder of the impact he’s capable of making in the win over Lyon with a late goal after coming off the bench. Barcelona secured a 5-1 victory at the Nou Camp, securing their place in Friday’s Champions League quarter-final draw.